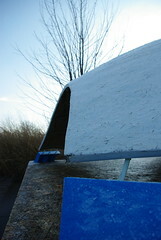 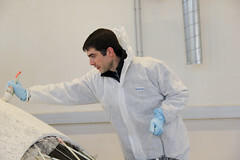 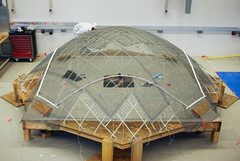 The simulation and construction of elastic gridshells in composite materials is nowadays a technique that one can consider mastered. 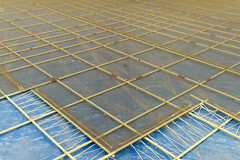 The bracing of the grid in its final form remains however a time consuming step with a lot of handiwork. 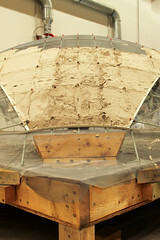 The lack of alternative to membrane covering is also an important limit to the development of such technology. 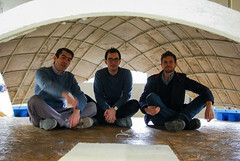 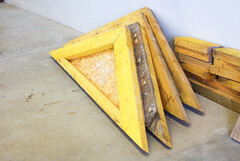 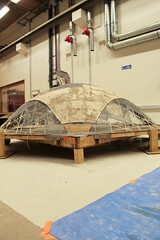 The proposed experiment tries to tackle both issues through a novel concept of hybrid structural skin made of an elastic gridshell braced with a concrete envelop. 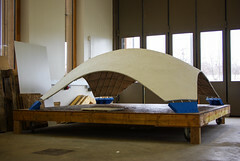 The idea is to use the gridshell as formwork for the concrete and to insure a connection between the thin concrete skin and the main grid, so that concrete assures the bracing of the grid and that the thickness of the concrete is reduced to a minimum. 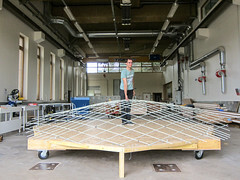 To demonstrate the feasibility and interest of this structural concept, a 10 m² prototype has been built. 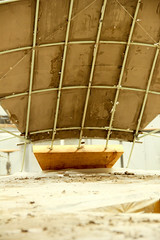 The construction of the concrete envelop was sponsored by FibraFlex who is greatly acknowledged here. 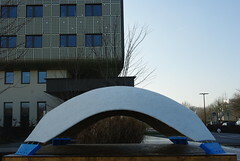 A measures campaign was also conducted in the framework of a student program at ENSG who kindly deployed its geomatic equipment to have a feedback on the geometry and mechanical behaviour of the structure. 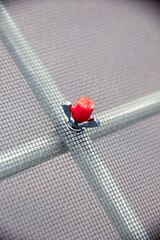 The single layer grid is made of 10mm composite rods assembled by 3mm screws and bolts. 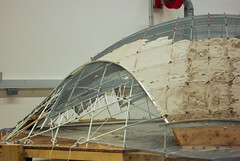 A plane canvas made of sewed strips of mosquito net was then set atop of the grid to deal as flexible formwork. 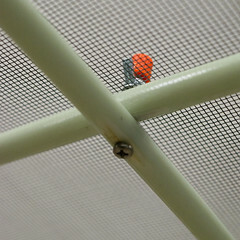 On the boundary, small sticks were installed within sheaths to prestress the canvas in both directions and give it out-of-plane stiffness, so that it can later carry the concrete. 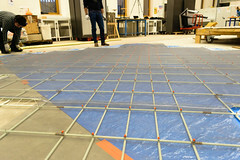 The relative positions of the grid and canvas were then fixed at connections which are finally covered with small height gauge made with a 3D-printer. 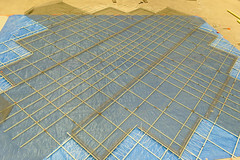 The grid is then deformed elastically by bending. 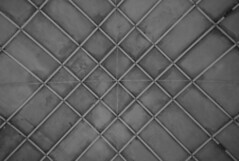 The canvas which is fixed to the grid is thus sheared. 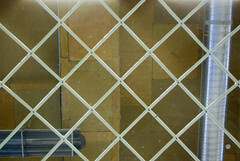 Its initial prestress avoid the appearance of wrinkles along the compressed diagonals. 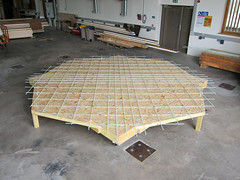 The final form of the grid is solely controlled by the positions of the members ends which have been preliminary marked on the wooden base. 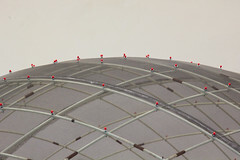 The ends of the main five members in each direction are thus stacked and glued in their final supports while the secondary members are fixed to metallic square by steel wires. 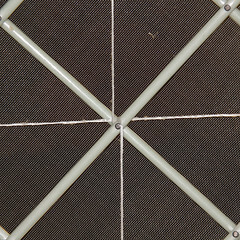 To reinforce the grid, three bracing cables are installed in each direction. 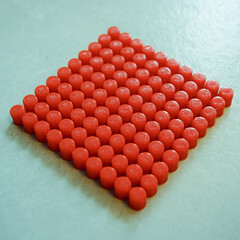 Small aggregates (diam.<4mm). 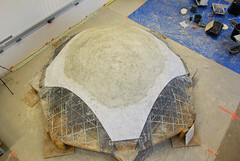 The concrete is in fact a mortar. 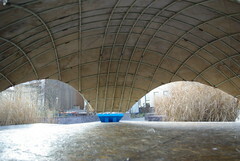 Water to cement ratio not too low (e/c>0.4) to minimize the dynamic viscosity. 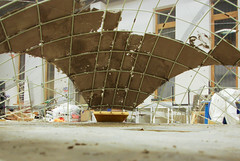 Incorporation of stainless steel fibers, the proportion of which was experimentally adjusted in order to obtain a satisfactory post-pic behavior in terms of ductility (0.5% mass). 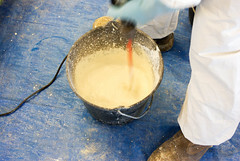 Use of admixtures which improve sticking on lost formwork and diminish the risk of early age cracking.